Spring is almost here and my mind turns towards lighter days, lighter foods and lighter wines to enjoy. Goodbye roast beef and burgundy for a while and hello to chicken salad on a sunny day with a glass of Astrid’s favourite chilled Percheron Viognier/Chenin Blanc from our good friend Geoff Walker and his wine importing business in York. The recipe is simple. Poached chicken, chilled and sliced. Lay gently into a glass dish on a bed of crisp lettuce. 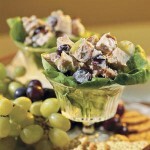 Garnish with walnuts or pecans. Splodge of mayonnaise (homemade if you can). Find a seat in the sun and open the wine. As for the wine Geoff says (and he should know) :”This up and coming winery on the West Coast of France, grows high quality Viognier and Chenin Blanc in the hot sun. The combination fills your mouth with bags of elegant fruit and a wonderful clean aftertaste.” If you contact Geoff he will delight you with the news that it only costs £6.95 and can be delivered anywhere in the UK in a couple of days.